According to this study by Linqia, 92% of the marketers who invested in influencer marketing in 2017 were satisfied with the results. Taking a cue from that, the budget that has been set for the coming years has increased. The study also mentions that the year 2018 predicted that about 39% of the eCommerce marketers raised the budget for influencer marketing. Talking about Influencer Marketing, you should first have a better understanding as to what exactly does the term mean. Marsha Collier, a renowned author and educator with the specialization in technology defined influencer marketing as, “building amplification and understanding of a brand through respected influencers”. Influencer marketing often goes hand-in-hand with the two other forms of marketing, i.e., social-media marketing and content marketing. According to the former, the influencers use their social media platforms to spread the word whereas; the latter is when the influencer carry a content element in which either you create content for the influencers, or they create the content themselves. For example, DJ Khaled, a prominent name in the hip-hop world and a renowned producer with about 3 million views on an average worked with W+K London. 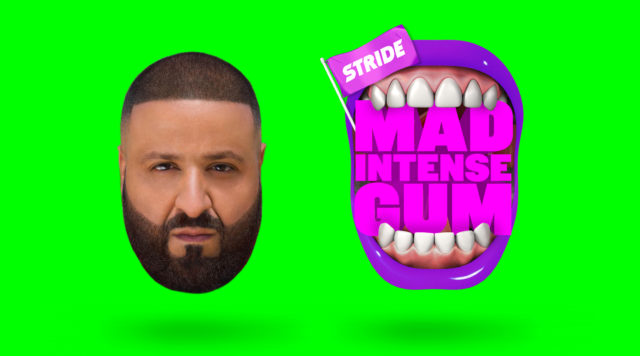 Working with W+K London, Stride Gum introduced a campaign with DJ Khaled did a campaign that turned out to be a massive hit. Now, the question is, what can you do to get the most out of influencer marketing in the coming year? Will the same tricks and strategies work for your eCommerce business or not? So, this blog will provide you with all the answers that you need. Let’s go ahead and take a look at the influencer marketing trends that you be aware of. One of the biggest trends that are definitely going to be around is video marketing. According to Kleiner Perkins report on Internet Trends, video marketing represents more than three-quarters of all internet traffic. Videos are more engaging, interesting and fun to watch. As a result, the influencers are ready to experiment with the video marketing trends. With the availability of Facebook Live, Instagram stories, Snapchat and other platforms, the message can be easily sent to the larger audience or the followers. This is one example where Gigi Hadid brands the Falsies Mascara by Maybelline. We already talked about video marketing is the key aspect of influencer marketing and Instagram is the king when it comes to videos or short stories. Did you know that Instagram has surpassed Snapchat and now has about 250 million (https://mention.com/blog/instagram-stories/) users? The credit for the growth and popularity of Instagram stories goes majorly to the influencers who’ve actually used the platform to its full form gaining more followers and also branding the products. A lot of changes have been made since Instagram stories came into existence. Now you can tag people/accounts, create ads, and also add links to the same. How to use the Instagram stories as influencer marketing trick? The Instagram stories are life only for 24 hours, so if you want your brand to go across with the urgency, you can ask your influencer not to spend time in designing the perfect video and posting it. The story can be a video that delivers the message better and promotes the content. With the popularity and positive results of influencer marketing, this doesn’t come as a surprise that more and more brands are going to opt for this medium of marketing to generate more revenues. 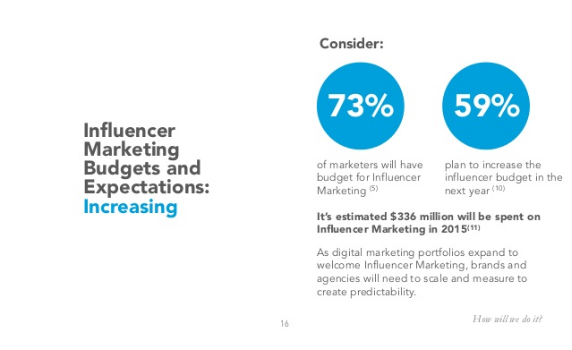 As a result, you can expect to see a bigger budget being allocated to the influencers in the coming year. According to Influencer Marketing Hub, 59% of marketers intend to increase their influencer marketing budget in the year 2016. Moreover, Marketing Land quotes that the total brand spending is projected to reach $101 billion by 2020. The brands are planning to focus on building a long-term relationship with the influencers and provide them with much more than just freebies or discounts to tag along. On the other hand, the influencers will have to think really hard to which brand to choose for a longer and more meaningful partnership. Have you been seeing visibly profitable results with your influencer marketing strategies? While it may sound very fancy that you have influencers working in branding your products but if there are no positive results, spending a lot of money on these marketing results is not what you would want to do. Measuring the effectiveness and ROI of the campaigns is essential and crucial at the same time. This means you can set the concrete metrics to track before launching the campaign such as hashtag usage, conversions, website traffic, the likes & comments and growth of followers. Just before you sign up with an influencer who can actually be an advantage for your brand, you can set down the objectives that you want to achieve from your campaign. The success of a campaign is dependent on the brands connecting with their audience with an influencer that is a credible social media figure. On the contrary, the demand of highly credible influencers has gone up, posing as an influencer by buying fake social media followers has become an easier option in today’s time. If you are spending huge amounts on the campaigns, make sure you pick an authentic influencer because fake influencers can cause a havoc for your brand as well as the revenues. Take time to choose the influencers that you want your brand to be associated with if you want to generate revenues and have a positive brand profile. How to select authentic influencers? You can choose “micro-influencers” at first if you have a smaller budget rather than spending all you have at once focusing on the big influencer that people relate to. Who are micro-influencers? Well, the micro-influencers are the ones who do not have a large following on social media platforms. In comparison to the mega-influencers, the micro-influencers take out time to actually work towards making the brand campaign a lot better. Eventually, you can shift to a mega-influencer who would do the work for you. As we have to come to that part where you know how important it is to invest in influencer marketing and also that what the year 2019 might bring for if you follow these trends, ION (https://www.ion.co/11-essential-stats-for-influencer-marketing-in-2016) states a few statistics that would sum it for you. The image below shows them better. Having known these, you must know the mistakes that an organization can make while investing in the influencer marketing trends. So, whether you’ve been burnt before or planning to go ahead and invest in 2019 influencer marketing, make sure you don’t make the following mistakes. Having a battle plan for influencer marketing is a must! Getting into 2019 influencer marketing for the sake of doing it would be a foolish idea and you obviously don’t want to do it that way. This is not about jumping on the bandwagon. Collaborating with any old influencer is not what it takes to succeed. List all important points to cover. With a plan that is detailed and covers all the aspects, there are chances that you will not go wrong. That the interests that your brand/product and your influencer are common. The expertise in a particular field. Know who you are: Knowing who you are would define what you’re looking for in your influencer. For example, when you are a baby store, you would want an influencer who’s a mother and a well-known personality too. We have already talked about it is not only about the number of followers an influencer has that matters. The first thing that you must know is that the brands or companies look for social media influencers with a huge number of followers that they have. Well, it is quite understood that it is all about the number of followers, right? Not necessarily! We don’t say that follower count doesn’t matter, but it is not the only factor to take into account when looking for an influencer. Don’t forget that the success of your campaign depends entirely on choosing the ideal person for the job. 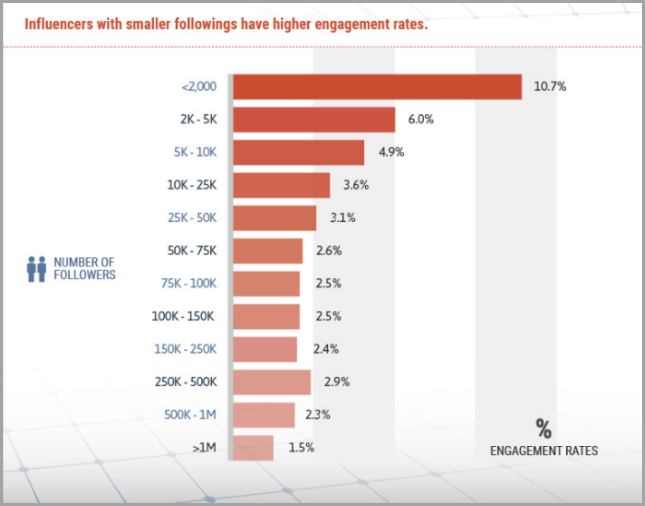 If you pay more attention to the number of followers and that itself is somewhere you ignore the engagement rates. It is not enough to have a lot of followers on the influencer’s account but what also counts is which influencers take their relationship to the next level by motivating and engaging their audience. According to Social Media Today, the following image details about the number of followers and the percentage of the engagement that they have. Make sure that the engagement is not overlooked by the number of followers. Well, the best examples are the micro-influencers who have a lower count in terms of followers but are more engaging. Influencer marketing is gaining popularity for a reason and that’s because it is generating positive results for the eCommerce marketers. However, nothing is certain and you cannot only rely on a person branding your product and it turning out to be beneficial for your business. Hence, keep your mind open and continue to invest in SEO techniques as well as other forms of marketing while branding your products.